There’s only one appropriate reaction when you hear that Universal Studios has opened a ride based on The Tonight Show Starring Jimmy Fallon: whah?!? A talk show does not naturally lend itself to a theme park ride. As fun as it might be to watch Jimmy Fallon and, say, Nicole Kidman flirt on TV, it’s not necessarily something you’ll want to squeeze into your already overstuffed day at Universal Studios. You’ve spent a lot of money to be here, and the Minions are calling. That’s what I thought as I entered the show building for Race Through New York Starring Jimmy Fallon for the first time. I knew it was a simulator ride, akin to the screen-heavy works common at Universal, but with a ride vehicle that was an entire theater, in the vein of Disney’s Soarin’. I knew the building’s exterior was themed to look like 30 Rockefeller Center in New York, where The Tonight Show is taped. I assumed it would be heavily tailored to fans of Fallon’s show. I didn’t know what it would actually do, though, or how it would try to adapt something that felt impossible to adapt into this medium. This is what it does: it makes you feel like you’re driving and flying through New York City. (And beyond…) It is a Soarin’ style video travelogue, but with a much faster pace, a few moments that recreate the sensation of falling, and a ton of references to Jimmy Fallon’s Tonight Show. And the whole time Fallon himself is there with you, spouting one-liners and jokes as your race rival, and also popping up in a variety of cameos. Even if you don’t recognize any of the characters from his show, or even like Fallon’s sense of humor, you might have a blast if you like the idea of sitting in a movie theater that makes it feel like you’re speeding through Times Square and soaring over the Empire State Building. That sense of motion is accomplished through a giant screen, 3D glasses and a theater built on top of hydraulics. The entire theater lurches forwards, backwards or to either side in conjunction with the images on the screen, making it feel like you’re falling out of the side of 30 Rock or almost running directly into a taxi. Other effects, including water and the piped-in smell of pizza, add to the illusion. 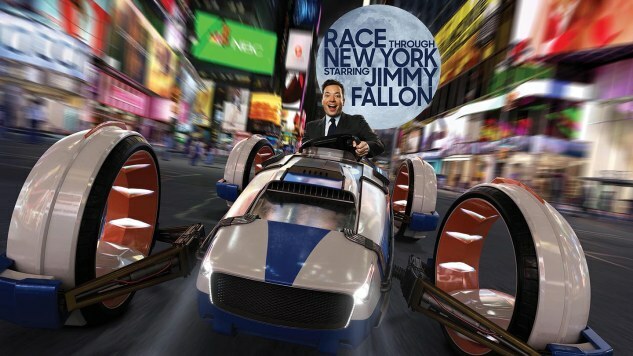 The story is that you’re in the audience at a Tonight Show taping, and instead of hosting a regular episode Fallon has decided to challenge you to a race for the Tonight Show Cup. Whoever hits three checkpoints and returns to the studio first wins. Even for a theme park ride, it’s not an especially exciting or memorable story—it’s just an excuse to set up the race. Once the race is on, those jokes, cameos and references arrive at a constant clip, and, again, if you’re not a fan of Fallon or the show, they probably won’t do anything for you. If you are a fan, you might get a kick out of the Ragtime Gals or Hashtag the Panda. I’ll be honest: I am not a fan of Fallon’s show. When I first rode Race Through New York, I had a hard time enjoying it because of the constant attempts at humor. I went on it a second time, though, and once I knew what to expect, I was able to focus on the ride experience itself. As a big box that shakes you up and makes you feel like you’re whizzing around one of the greatest cities on Earth, Race Through New York is a fun and exciting jolt of frenetic action. It may not be a work of art, in a theme park sense, but it’s a fine way to fill out your day at Universal Studios. The best thing about the ride is the queue. With this attraction Universal introduces its new concept of a virtual line, which aims to eliminate the endless sense of waiting and time-wasting that’s so thoroughly baked into the theme park experience. Here’s how it works with Race Through New York: you use the Universal app or a kiosk outside the ride to pick a reservation time. You come back during that window and are given a color-coded ticket as you walk in. There are six colors, the same six found in the NBC peacock. The first floor of the building houses what might be the best part of the entire attraction: a small Tonight Show museum in a room themed to look like the 30 Rock lobby. There are displays for every era and host of The Tonight Show. (Conan O’Brien’s one lonely window is a sad reminder of what could have been.) You can check out Johnny Carson’s Carnac hat, one of Jay Leno’s suits, Jack Paar’s microphone, Steve Allen’s piano, and even a Triumph the Insult Comic Dog puppet in the Conan display. After a certain period of time you’ll hear the NBC chimes and the peacock lights on the wall will all change to a single color. If that color matches your ticket, you go upstairs to a second waiting area. Here you can sit down, play various touchscreen games based on Fallon’s show, watch clips, or enjoy live entertainment from the Ragtime Gals (who sing barbershop quartet versions of pop and rap songs) and Hashtag the Panda (who just dances, I guess?). Eventually the peacock logos on this floor will also change to a single color, and when that matches your ticket, it’s time to approach the ride theater. After a short safety video (which is rapped by Black Thought of the Roots), the doors open, and you enter a theater that looks like Studio 6B in Rockefeller Center, where Fallon’s show is taped. The ride then begins. I have no idea how smoothly this process will work on a typical busy day at Universal. By providing a legitimately interesting exhibit and live entertainment, and replacing the winding walkway common at most theme park attractions, Universal might’ve hit on a way to make the typical ride wait time less of a drag than usual. And by including glimpses at the previous Tonight Show hosts, it reminds those of us who aren’t Fallon fans that the show itself has a rich, important history worthy of being commemorated. Race Through New York is a reminder of the value of theming in a theme park. This is an experience that hinges on design and architecture more than the ride itself, from the exterior, which seamlessly fits an iconic part of Manhattan’s skyline into Universal’s New York area, to the two pre-show waiting areas, which look and feel like they were imported straight from the real 30 Rock. The motion simulator itself is a fine mid-level attraction in a park that currently needs more to do, particularly things that aren’t primarily targeting children. (Don’t worry, though, parents: none of the humor here is inappropriate for kids.) It may not make a lot of sense on the surface, but in execution this Tonight Show ride is a nice addition to Universal Studios. Garrett Martin edits Paste’s comedy, games and wrestling sections, and writes about theme parks whenever he can. He would’ve loved to have seen a David Letterman ride. He’s on Twitter @grmartin.